The big weekend at the club has just ended as our Cork visitors headed off on their long journey home on Sunday afternoon writes John Murphy. It was a fantastic weekend enjoyed by all, and we wish to thank all those who helped in any small way in making this such a successful event. Congratulations are due to Killshannig as they retained the Girl’s trophy and won the Boy’s Tomas Russell Cup for the first time. Pictures of the weekend will be uploaded to the Facebook page. Thanks to Saul and Loughinisland for coming in on Saturday to participate in our blitz with Killshannig. Caption for photo. 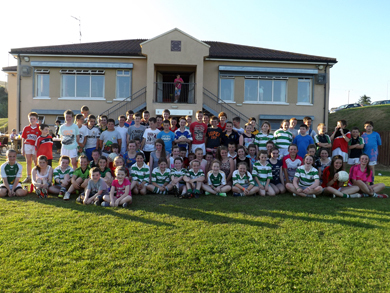 Killshannig Tomas Russell U13 Boys & Girls from Cork pictured with their RGU counterparts at the club BBQ on Friday night. Well done to the RGU Gaelic4Girls who graced Croke Park last Monday in the National Blitz. The girls had a super time and were left with great memories and hopefully filled with inspiration to continue playing gaelic football. Football returns this week as the U-16’s take on Saul on Thursday and the Seniors travel to Mayobridge on Friday night. The Championship starts for the U14’s on Monday night as they take on Carryduff at PTR in the first of the round robin games. The Senior championship starts with a match against Kilcoo in Newry on Sun 11 August. The U-8’s travel to Annsborough for Go Games and U-10’s are at home for their Go Games on Saturday. The Annual RGU 10k race i son Wednesday 24 July Contact Colm on 07815839630 for details. Register at the clubhouse from 5.30 onwards. Saturday 27 July is President’s Night. John Mullan had nominated the Down Respiratory Group as his charity so we would encourage all our members and friends to come along for a great nights entertainment with light supper provided. Entry to the RGU U-8 Tournament on 10 Aug is still open, so contact John 07881626972 for details. At present the U-10 and U-12 tournaments are fully subscribed. Tickets are now on sale for the Wolfe Tones. They are coming to the club on 24 Aug, tickets cost £20. There will be a range of other events on the August Bank Holiday weekend, details to be confirmed. Contact Edel on 07759418419 for tickets.